I'm coming to this a little late as I didn't know about the challenge until I read the latest issue of Roundhouse, just a month remaining so I will need to get my skates on but decided to try and enter anyway. I moved into a new house with a garage over the summer and finally have a space to model without hogging the kitchen table. I was looking for an excuse to unpack some of my modelling stuff, and this challenge seems like a good excuse. I've got lots of building kits sitting in boxes but one of them struck me as being ideal for this purpose. Its an old Woodland Scenics gas station I bought second hand on e-bay for a couple of quid. This kit is unusual because it is cast in white metal rather than resin or plastic, and it should build into a very dinky little model of a pre-war gas station, complete with old style pumps. The kit is unboxed and has no instructions or decals, so although it looks simple to construct I will need to get busy with photoshop and the inkjet to rustle up some suitable signage. The white metal castings area bit warped, but that shouldn't be a problem with such a rustic style of building, and there is a lot of flash to clean up which will be the first task. I'm planning to incorporate the finished building into a 12" square base so it can be entered into the square footer competition at the convention (assuming that category features). The diorama will have an old 60's billboard advert and a section of highway. I doubt I will get all of that done by the end of the month, but hopefully the building will be finished at least. Welcome to the challenge - looking forward to seeing your progress on this unusual model. I got started on the Gas Station build after spending an hour or so searching through boxes for my supply of sheet styrene and some other useful odds and ends. I used a file to clean up the worst of the molding flash and then superglued the main walls together. The parts are not a great fit so I will need to fill a few gaps before painting it. I decided I'm not keen on the kit roof, its got a odd gable that makes the structure feel a bit like a dolls house and there is no easy way to remove it because the entire roof is cast in two parts. I will need to build a new roof out of styrene, and I also decided to build an extension at the rear of the building to bulk the size up a bit. The styrene base piece will simulate a concrete apron for the forecourt and will hold everything in place while the build progresses. I built a simple interior floor piece which I will detail with a sales counter to give the illusion of detail when looking through the large front windows and began cutting the walls for the rear extension. This will be detailed to look like wooden siding using styrene strip. I spent a few more hours on my gas station build this week and made some good progress. The kit was missing it's decals so I decided to create my own. This is the first time I've tried using blank decal paper and it will be interesting to see how it turns out. 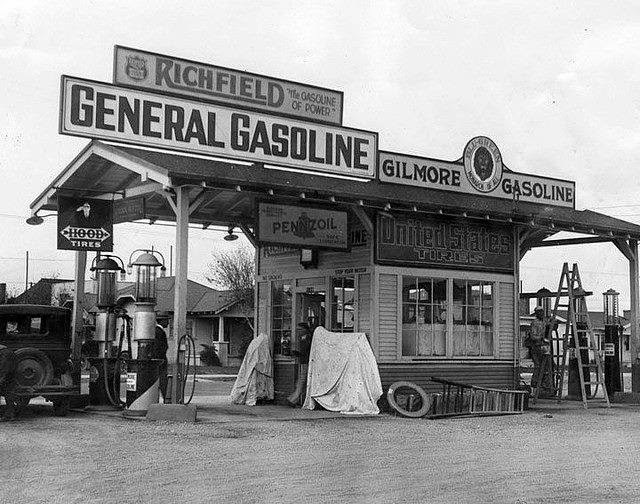 I did a google search for old gas stations and found this great photograph of an old Gilmore gas station in California which seems like a similar prototype to the Woodland Scenics kit albeit a slightly grander version. I model East Coast roads so a Californian company name wouldn't be suitable so I decided to freelance a design based on the colours and lettering of the Gilmore signage. I used Photoshop to build up a page of decals, using measurements from the kit parts to make sure they were the correct size and printed a 1cm ruler on the test page to make sure it was printing at the right size. I've made a selection of signs including a large banner sign I intend to mount on the roof of the building. I will also need to make some small signs for the pump island and oil rack. The decal paper is transparent so I will need to paint the signs white before I apply the decals, then paint around them to complete the model. I finished the interior detailing and scribed the styrene floor so it resembled wooden boards. This detail will most likely be obscured by the window detailing but I wanted to add it anyway just in case. The rear of the building has a lean-to extension, again made from styrene scribed to resemble wooden siding. I score the styrene with a scalpel and then use a needle file to scribe the score and thicken the line so it resembles a gap between boards. I added an access door using the same method. I also added the sub roof for the lean to, this will be clad with tinfoil to represent tar paper and painted black. I cut in some grooves to suggest planks on the outer edge of the roof. 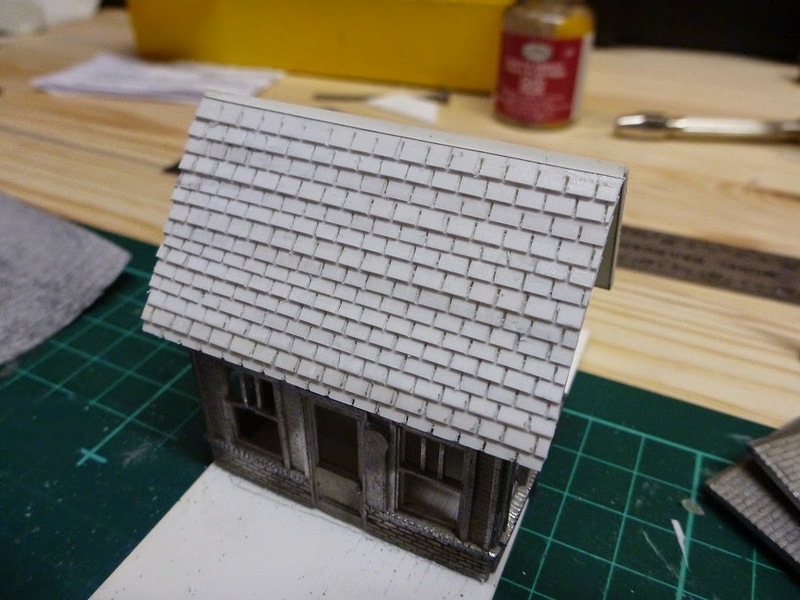 The next step will be the main roof, which I plan to create from styrene with overlapping roof tiles made from evergreen strip, and the roof mounted sign board. The sign board will have the decals applied and I will find out if they will actually work. Last edited by johnlewis on Fri Feb 27, 2015 10:50 pm, edited 1 time in total. Today I spent a bit more time working on the Gas Station for the NMRA forum challenge. I couldn't find any suitable roofing material in my box of bits so I decided to cut my own roof tiles from styrene. First I created a replacement roof using the dimensions of the original kit parts and braced the inside of the roof to make sure it is strong enough to withstand the handling I expect it will receive during exhibitions. The roof tiles were measured on a sheet of 0.3mm styrene and then notched with a razor saw, I notched along an entire row then cut it from the sheet in one piece. This took a LONG time, and I probably would have ordered some laser cut tiles if I'd realised how big a job it would be! Once I had a stockpile of tile strips I glued them in place one at a time, using a steel rule to help make sure they were more or less straight. Small imperfections are in keeping with such a rustic prototype so I didn't worry too much about precision here. I wanted to give the building a rustic feel so I added a beaten up tar paper roof to the lean to shed using small pieces of tin foil cut to size and superglued in place. I will paint it dark grey to make it look like weathered felt. The roof edges were looking a bit plain so I added some bracing under the eaves to give extra detail, and also decided to create a small rain porch roof over the front door and some paving slabs around the edge of the building. With the roof tiling done I started on the signage. I had already printed my decals but I wasn't sure what to expect as this is my first time trying to create my own. I had a few problems getting the decals off the backing paper and the first roof sign ended up splitting into six parts and the smaller posters came off on the blotting paper! More practice needed I think. The weather was favorable so I took advantage of the opportunity to get the model primed and ready for painting. I used a cardboard box as a makeshift spray booth and a rattle can of acrylic primer. I'm pleased with the progress so far, hopefully tomorrow I will get started on painting the final base coat. There is just a week until the deadline so I'm not sure how much I can get done by then. The deadline is looming so I spent an hour or so this evening starting the painting of the completed gas station model. I mixed a little white into some regular Revell Aqua yellow to approximate the Gilmore Gasoline cream colour and brush painted the main walls and the counter inside. This first coat is a bit rough and ready, but it should be fine because I am planning to weather the finished model to represent an almost out of business station at the end of its working life rather than a brand new structure. The roof and brickwork have been picked out in terracotta and boxcar red, and that is as far as I got this evening. I will hopefully get the detail painting started tomorrow, with the window frames and doors getting a coat of burgundy/red to match the decals. I also need to make a third attempt at the decals, this time I will try applying them with some Mig decal set which will hopefully help them stay put. An update on the gas station build, continuing the painting and adding the secondary colour to the main structure. The looming deadline made me rush things a bit and that resulted in a few mistakes and blotches in the paintwork. I will need to patch some of the main wall colour before I add the rest of the weathering in the next session. The missing parts for the gas pumps are beginning to bug me, so I may have to give in to the temptation to buy another kit to complete them! We shall see. The challenge deadline is two days away so I am still working full tilt on the gas station, I retouched the paint around the windows and fixed some areas where the grime wash had been a little too heavy. I created a few more decals and printed them on my laser jet, then placed them directly onto thin styrene to make the signs and glued them in place. Each sign received a brown painted edge to make them look like rusting tinplate. The glazing was added using canopy glue and I printed a set of window blinds on paper to add some extra detail, designing the page so that it would print double sided. I also created a few small pamphlets and a poster to add some detail to the counter area. The missing gas pump details were tricky to fix, I tried creating a replacement cap piece out of styrene but it wasn't possible to match the existing kit part as it is a very smooth round sign with a frame. I also realised that there were more pieces missing than I had realised, a google search for images of the kit showed that the gas pumps should have three parts, I only had two, there should be a cylindrical 'sight glass' section to them. I pulled the pumps apart again and fashioned a pair of sight glass sections from some sprue I had in my bits box. I was seriously considering buying a second kit to obtain the missing cap piece when it occured to me that one way to get round the problem was to cover it up. I fashioned a small 'tarp' from tin foil and made the pump look as if it was broken and out of use. Job done. The final work completed this evening was the rooftop sign, this is a tricky shape to cut due to my decision to try and emulate the Gilmore Gas logo with it's circle motif. I attached the sign decal to a piece of styrene and trimmed round it to create a closer match. The sign will be painted before it is attached to the main roof of the gas station, and should look very close to the one from the original reference image I posted earlier. Last edited by johnlewis on Fri Feb 27, 2015 10:54 pm, edited 1 time in total. With the challenge deadline upon us I sat down at the workbench and finished the final details on the gas station this evening. The roof sign received a coat of paint before being superglued to the roof. The gas pumps each gained a hose cut from thin insulated wire and glued to the base, as well as some extra colour on the small details, I picked out the various rags and details with some neutral blue paint using a fine brush. I also cleaned up the edges on the tops of the walls, I plan to keep the roof removable and I decided to paint them and make the presentation a bit neater. With all that done the model is complete. It's been a lot of fun putting it together and I'm really pleased with the final result. I still plan to use it as part of a square-foot diorama but that will need to wait for another day as I am out of time. Here are some detail shots of the finished gas station.